Organise your next special event with Delta Force party invitations. At Delta Force we love our jobs – each week we get to play host to countless birthdays and other special events. We get to share in the fun and excitement of the big occasions, and what better venue to celebrate at with your friends and family that at Delta Force with an adrenaline-pumping day of outdoor paintballing action. 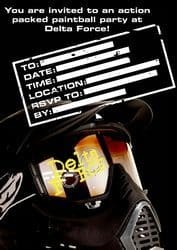 Now, in an additional effort to provide you with the ultimate paintball experience, Delta Force have created a range of party invitations to make organising the event even easier. You can download the range of invitations here, and then send them out to all of your friends to let them know that you’re celebrating you birthday with the UK’s premium paintball centre and you want them to join you for the special occasion. If you have a birthday, Stag or Hen party, or any other special event coming up, then why not visit Delta Force – we have almost 20 years of hosting special events for our beloved customers. Dan Young recently organised his son’s 11th birthday at the Delta Force paintball centre in Effingham, Surrey, and wrote in to say thanks. So if you want to join the list of happy Delta Force customers then contact our friendly booking office on 0844 477 5050, and don’t forgot to let the event coordinator know if it is a special event such as a birthday. Once you have organised your paintball event with Delta Force, click here to download the party invitations and let your friends and family know that you’re celebrating with Delta Force. Delta Force – the UK’s premium paintballing centre for all occasions. 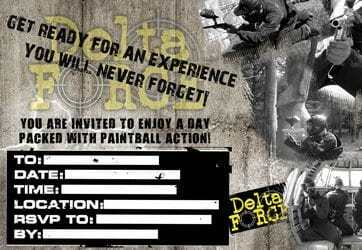 Paintballing with Delta Force this Easter holidays!